Much of the logging in the western Lake Superior region took place in the Arrowhead along the lake’s North Shore (northern Wisconsin was also logged thoroughly, as were Isle Royale and the Apostle Islands). Minnesota lumberjacks felled enough timber between 1891 and 1924 to produce nearly eight billion board feet of lumber. The work was hard and the conditions cold; the logging season stretched from November to April as the frozen ground prevented oxen and draft horses from bogging down under their heavy loads. At the work site, the foreman oversaw everything, from the building of the camp to tree selection — even where the trees should fall (a timber cruiser or “landlooker” was sent ahead by lumber companies to scout which stands of trees to harvest). A logging crew typically consisted of two sawyers, a swamper, a chainer, a teamster, a sled tender, a decker, and a groundhog. The sawyers notched trees with an axe then worked in pairs with a cross-cut saw to take the tree down; on a good day a team of sawyers could cut up to one hundred white pines. Swampers trimmed limbs off felled trees, cleared brush, kept roadways clear, and removed manure. Teamsters (also called skidders) used horses to pull felled trees from where they were cut to landing areas where they were later loaded and sent to lumber mills. If the tree was less than a mile from the loading area, it was dragged out with chains (attached by the chainer to a go-devil, a wishbone-shaped tree crotch); when trees were felled further away, the groundhogs stacked logs on sleighs pulled by teams of oxen or draft horses using cant hooks. (Horses were later replaced by steam powered tractors called log-haulers, which could pull several sleighs). The road monkey was the man in charge of building and maintaining logging roads, often made of ice so the sleighs could move more easily. Along downhill grades of the ice roads, a worker called the hayman-on-the-hill threw down hay to slow the sleighs so they would not overcome the teams of horses pulling them. One site of the North Shore’s logging heyday has become a stunning spot to view fall colors. Heartbreak Ridge (located northwest of Schroeder on Forest Road 166, west of the Sawbill Trail) takes its name from its steep grade, which was often too much for even the sturdiest of horses when it was covered with ice and snow. Consequently, teamsters could not move logs up and down the rise, and bypassing the ridge created extra work; they spent more time removing fewer trees, thereby making less money, and breaking their hearts. Once at the landing area, deckers made parallel stacks of logs so they could more easily be rolled into the river for transport to the mills. In the water men tied the logs into giant rafts which they floated or towed downstream to Lake Superior and the mills. The men who worked these rafts — called rivermen, river drivers, and riverhogs — used a cant hook to maneuver logs. Their task was called cordelling: walking along the river bank, keeping the logs moving wherever boats could not help navigate the rafts. Occasionally they had to walk out on the logs to keep a raft moving. This job was the task of the birler, a highly skilled river hog who wore calked (spiked) boots and used small, quick steps to spin logs into place as he moved about a log raft. After a successful run bringing logs to the mills, birlers would sometimes compete with each other, two on a log, trying to see who could make the other fall off; this activity developed into the sport of logrolling. Occasionally logs would pile up during a drive, creating a literal logjam. In extreme cases, dynamite was used to clear the jams (remnants of jam-clearing blasts can be seen along the Cross River). Once a raft was brought to Lake Superior’s shores, logging outfits leased tugs, steam barges, and scows to tow them to mills in Duluth; Ashland, Wisconsin; Baraga, Michigan; and other mill towns. Later trains were used to transport the logs; flat cars were loaded at first by a loading gang of groundhogs using jammers, crane-like devices powered by horse (they were eventually replaced with steam loaders). Lumber companies laid hundreds of miles of track to harvest trees on the North Shore. Trucks have been used since the 1930s. 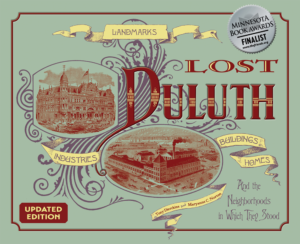 The success of the logging industry rose and fell with the economy — when Duluth boomed, so did timber production. Major logging outfits included the Schroeder Company, which logged along the Cross and Temperance rivers, and the Alger-Smith Company, the largest operation to log the Arrowhead. 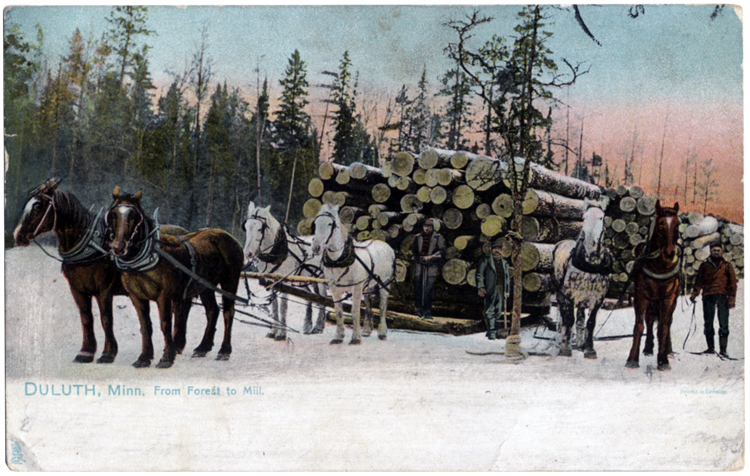 Logging reached its peak during the first decade of the twentieth century and was thought all but dead in Duluth by 1920. Still, it hung on through the twenties, but was hit particularly hard by the Great Depression and the creation of the Superior National Forest, and never quite recovered. In 1941 the last logging railroad was dismantled. Some logging still takes place in northern Minnesota, but most of it is done outside the Arrowhead region. Today’s loggers use heavy machinery rather than hand tools, and transport logs on flatbed semis. But some things never change: in January 2006, Minnesota logging companies reported that production had been slowed by the unusually warm winter, causing logging trucks — like the teams of oxen and draft horses before them — great difficulty when moving their heavy loads over the soft, unfrozen ground. Heartbreak Ridge all over again.